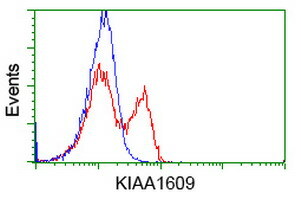 KIAA1609 antibody LS-C175772 is an unconjugated mouse monoclonal antibody to human KIAA1609 (TLDC1). Validated for Flow, IF and WB. 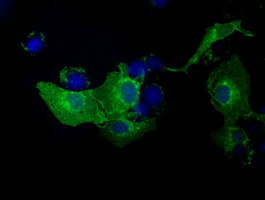 HEK293T cells transfected with either overexpress plasmid (Red) or empty vector control plasmid (Blue) were immunostained by anti-KIAA1609 antibody, and then analyzed by flow cytometry.